USD is still falling against the JPY. This pair is also under the influence of some economic data such as Crude Oil Inventories, Distillate Inventories, Gasoline Inventories, Refinery Utilization in the US and Adjusted Current Account, Current Account and Trade Balance BOP Basis in Japan. Taking the long term look the USDJPY is falling down the descendant channel. The support lies at 100.600 with resistance at 101.260 which both lines are below the weekly pivot point at 102.410. The EMA of 10 is moving with bearish bias along with the EMA of 75. The RSI is in oversold area, the MACD indicator is in negative territory and the Stochastic is showing downward momentum. 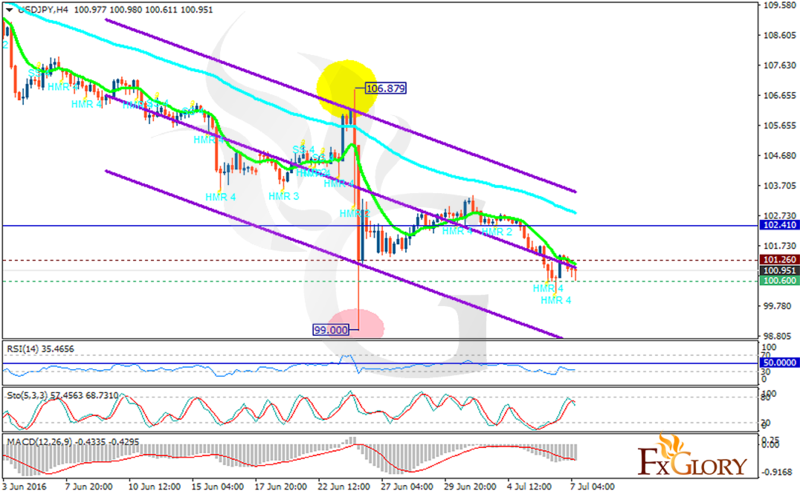 The pair will continue its bearish trend targeting 99.00.